Like Mumbai’s famous Vada and Pav (Vada-Pav)combination, m- indicator has become a part and parcel of every Mumbaikars lives. m-Indicator is a powerful tool that almost every Mumbaikar carry in his/her pocket. In mumbai the cheapest and the best mode of transport is train and knowing the train timings really helps everyone reach office on time. 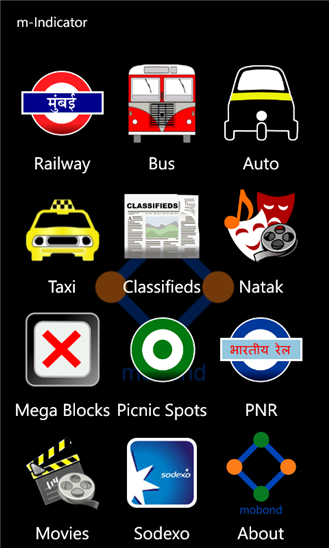 Not only train, this piece of software will give you information of Bus route, Auto fare , Taxi Fare, Mega blocks, Classifieds,Natak, Picnic spots, PNR, Movies and Sodexo. m-Indicator is developed by Mobond. Mobond is a combination of two words, Mob and Bond. It means ‘bonding the mob’ or ‘bonding the angry crowd’. m-Indicator supports Symbian, Android, Blackberry and finally Windows Phone as well. You can now download m- Indicator from http://m.mobond.com/install.jsp . Choose the appropriate version suitable for your mobile. Complete update of Central line timetable,effective from 15 Oct 2012. New service “Natak Cinema daily schedule” added. Modern User Interface in Railway, BEST, Auto-Taxi. Mumbai Auto Taxi Fares updated,effective from 11th Oct 2012. Click to complain feature. Neral- Aman Lodge – Matheran timetable updated. Updated list of MTDC approved budget hotels added in “Picnic Spots” section. Even I have installed it on my Nokia Lumia 800 and i loved it. It will be a boon to all Windows Phone users in Mumbai. Thanks again Mobond Team for developing this wonderful app for the masses. I hope you guys keep up the good work and add more and more useful links in m-Indicator which would help us in our day to day life. My bio goes beyond Studies, More precisely, I am a Part time blogger. My mission is simple, To connect with people and to help them.